As a fitness icon and motivational mastermind, Shaun T has helped millions of people transform their bodies and their lives through his Hip Hop Abs, INSANITY, and CIZE workouts. But people who think of Shaun T as just a workout force are missing something. He has always focused on building inner strength first, then moving to the exterior. And that inner focus started in his own life. He became the man and motivator he is today after escaping from the abuse he suffered as a child, and fighting his way back from a 50-pound weight gain in his early 20s. He knows firsthand that you can't drop weight or enjoy better health until you overcome the mental obstacles that cause bad choices in the first place.In T is for Transformation, Shaun T unveils the 7 transformational principles that guided his progress through life and that are at the core of his incredibly successful workouts. T is for Transformation is a motivational master class as Shaun shows you how to become more flexible and resourceful, give everything you've got, and, most importantly, trust and believe in your path to success. 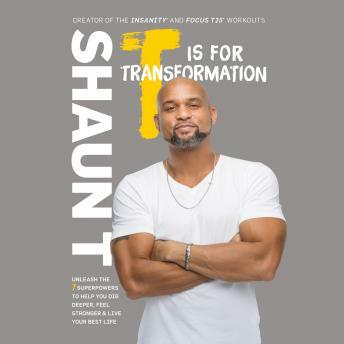 The only real obstacles in life are the mental ones, and T is for Transformation can train you to achieve astonishing results in your own life, just as Shaun T has in his. Shaun T has been inspiring me physically with his workouts and now he’s really inspired me mentally! This book is great and I love his voice so much. Truth Bomb: Shaun T is awesome. I really enjoyed this book. I haven’t stopped thinking about my 5 Core ppl!!! I can’t stop thinking that I have a friend I continue to be friends with even though I know I shouldn’t. This book has really made me think and Shaun T is a true inspiration and I’m glad he found happiness and now has such a beautiful family. God bless him!